What does Yoga have to do with Farming? Join Farmer Foodshare for a yoga class followed by a small meal and discussion of mindful eating. Come learn how yoga principles and mindful eating relate to sustainable farming! Farmer Foodshare interns/certified yoga teachers Taylor Jost and Everette Oxrider are offering a one-time yoga class/food workshop on Sunday, April 7. Read on for Taylor’s personal story of how it’s all connected. Dairy makes me depressed. Literally. Don’t get me wrong, I was a huge milk drinker growing up (a glass with every meal! ), and when I went vegetarian in high school, I overcompensated with all the greek yogurt and cheese in the world. As if the normal coming-of-age chaos during my time in high school wasn’t enough, the massive wave of dairy only further deepened my depression and anxiety. Did you know that 95% of serotonin is produced in the gut? I find this absolutely mind-boggling. But it kind of explains why, for me, dropping the dairy and eating more greens really helped my depression and anxiety. The point of this story is not to tell you to stop eating dairy; instead, I want you to listen to your body and ask whether the things you are eating serve you and make you feel good. Where was my food grown? How did it get to my plate? Does the cost of my food equitably compensate the people involved in getting it to my plate? What environmental degradation occurred so that I could eat this meal? What we practice on the mat in yoga has the ability to extend into every outlet of our lives, even to the dinner table. Yoga is about listening to our bodies, being mindful of our actions, and learning to detach from anything not serving our greater purpose. Yoga calls us to be mindful of what we are putting into our bodies and where this food comes from. Practicing mindfulness is an effective way to recognize the flaws in our food system and allows us to make better choices to resist this system. 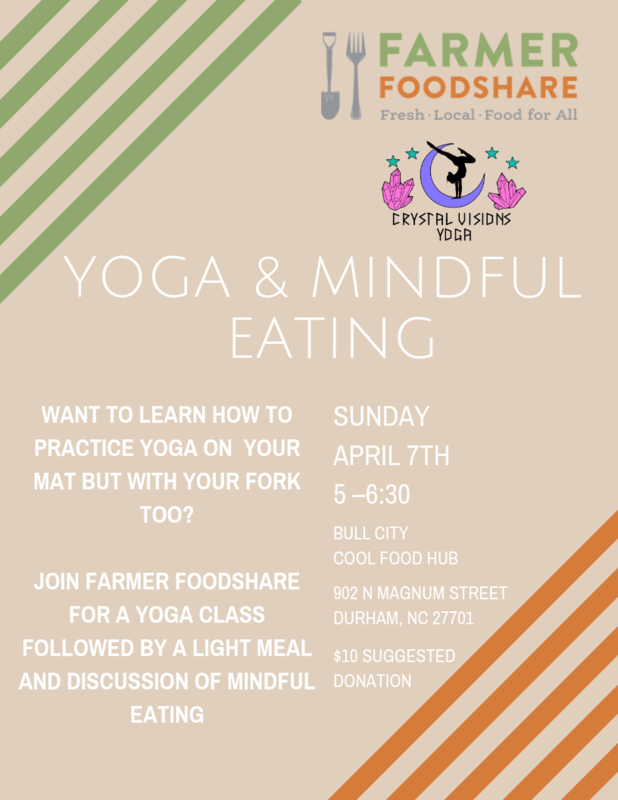 If you want to learn more about the intersection between yoga, mindfulness, and food – join Farmer Foodshare for a yoga class followed by a small meal and discussion of mindful eating. I will be leading the flow and discussion, and Everette Oxrider, another Farmer Foodshare intern, will provide optional adjustments and modifications during yoga. This flow will be accessible to all levels of practitioner, target all muscle groups, increase flexibility, and will strengthen the connection between mind, body, and soul. Come breathe, stretch, and eat with Farmer Foodshare in community. WHAT TO BRING? We will have some mats, but feel free to bring your own!